A change in the family farming partnership in 2009 provided four brothers and their parents with the ideal opportunity to change the direction of their business and ultimately milk more cows. Katie Jones reports. For the Marrow family the aim is now simple; to utilise the sandy loam their farm sits on to grow more grass, and milk as many cows as their grazing platform allows. George and Heather Marrow farm alongside their sons, Will (28), Andy (26), Dave (24) and Pete (22), at Bagmere Farm, near Sandbach, Cheshire. Despite the family now focusing on dairy production, the farm has in the past operated as a mixed enterprise. In 2009, after George’s brother retired from the business, the family decided to change from an all-year-round herd of Holstein Friesians, to a 500-cow herd made up of mainly New Zealand genetics and go down the grazing route. The herd is now split into a 370-cow spring-calving group, and a 130-cow autumn-calving group, which allows them to produce milk all-year-round for their Joseph Heler milk solids contract. Average annual yields stand at 5,100 litres at 4.75 per cent fat, and 3.67 per cent protein. The spring calvers go out after calving from early February, and will graze until the beginning of December, while the autumn group calve from October to November, and start their grazing season towards the beginning of April, or the ‘magic day’ when grass supply matches grass demand. 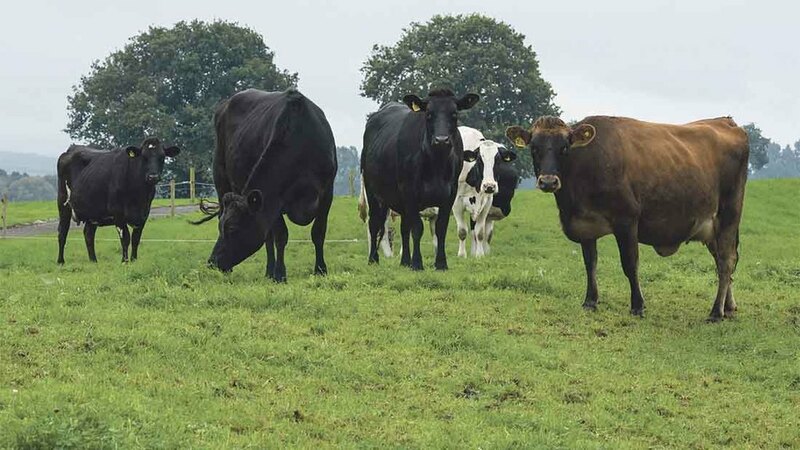 Bagmere Farm comprises 121 hectares (301 acres) which makes up the grazing platform, with another 72ha (178 acres) of rented land acting as ‘support ground’ for the growing of forage crops. Andy says: “The farm is split into 26 paddocks of around 5ha each. The cows go in when covers are about 3,000kg/dry matter/ha and we are aiming to graze down to about 1,500kg/DM/ha. Paddocks start getting shut up ready for the next season at the beginning of October, and Andy says 60 per cent of the paddocks are utilised in October, and dropping down to 40 per cent in November to ensure there is grass ready again in February. Grass is measured weekly using a rising plate meter in order to work out grazing rotations. With much of their farming inspiration taken from New Zealand-type systems, the brothers have been involved in various grazing discussion groups, and Will, Andy and Dave have spent some time in New Zealand itself. Now all four, who all studied at Reaseheath College, are involved in the day-to-day running of the farm, although Will also has his own agricultural contracting business. As Dave explains each of them take an active role in every part of the business. They are all heavily involved in the financial planning and Dave says they have been discussing budgets, monthly, since 2010. “These budgets are monitored, and particularly at the start that was needed to track where the farm was going, as a lot can change in a month. As an example Andy says they have started to look at where they can cut some concentrate costs this winter. Concentrate usage is already relatively low, with spring calvers receiving none so far this year, and last year they were fed 300kg. The autumn calvers usually get about 1.2t. To begin with the family used a consultant from New Zealand to provide them with guidance. “This really kept us on track, as it would have been easy to go off in the wrong direction,” says Andy. After making the decision to go down the grazing route the family sold much of the existing herd, and bought-in a lot of heifers from Ireland to get the genetics they wanted. With the 4.5km of concrete sleeper cow tracks providing the ‘backbone’ of the grazing platform, installing these was one of the first jobs the family had to set about doing. “We set it all up ourselves, and as we have our own digger we would put a lot of the infrastructure in ourselves,” says Will. Cows were grazed in paddocks for the first time in 2010, after half of the farm tracks were installed, and then the other half were put in the following year. Two 2,270-litre water troughs, supplied by a ring main, were put in each paddock. Another development has been the installation of a 40:80 Waikato parlour, which Andy describes as having ‘no frills’. The parlour, sited in a 42-metre (135ft) long shed, was fabricated on-site to save costs. There is also a circular collecting yard, typical of New Zealand design, which was designed with good cow flow in mind. “The circular collecting yard, has a backing gate, which scrapes and washes the yard as it moved around,” says Andy. 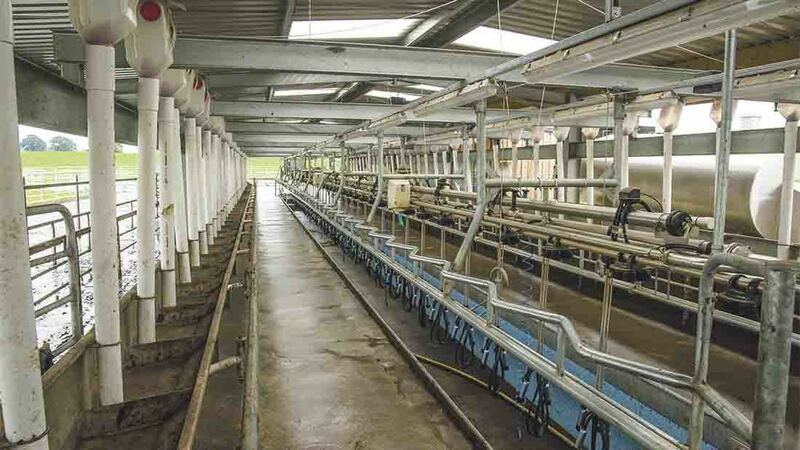 This set-up replaced the existing 20:40 parlour, and has rapidly sped up milking times. “It was taking far too long, but now milking is taking about four or five hours a day in total. We can milk about 320-360 cows an hour in the summer months when we are not picking out bulling cows, with just two people in the parlour”, says Andy. Heat detection is done using tail paint, with three trained to do AI. Andy explains they are aiming to get a cross-bred type, and have used a lot of genetics from New Zealand breeding company LIC to achieve this. Youngstock is reared on a farm 17 miles away near Leek, which the family started renting in 2013. The 300 heifers graze paddocks over 73ha (180 acres) and run with 14 stock bulls, with in-calf rates standing at 88 per cent for the first three weeks of the mating season. Pete takes charge during the calving blocks, and is also responsible for calf rearing, with good results seen to date. “We calve everything in an old roofed silage pit. The shed is bedded down every day, and cleaned out twice-a-week, with dirty bedding shifted out to the back of the shed behind a wire, to keep the calving area clean and dry. Pete says they do not see many cases of scours, and attention to detail during calving and rearing means mortality rates stand at less than 2 per cent. With grass being a fundamental part of the business much of the farm has been reseeded since 2009, and now the poorer performing paddocks are direct drilled with high sugar Aber varieties. “We are looking for late heading diploid rye-grasses,” says Andy. A balance of white clover in the grazing lays, about 30 per cent, helps with nitrogen uptake and the family say they are now growing about 15t DM/ha off 150kg nitrogen/ha. This attention to detail and a clear focus on the having the right business for their family, and farm type, has resulted in Bagmere Farm recently being crowned supreme champion farm in the Cheshire Farms Competition 2016. And now with thoughts turning to the future and with the grazing platform at full capacity, the family is looking at its options for the next step. But they all agree if a second unit were to be taken on it would have to be the right opportunity for all involved. Previous: User Story: Magnum Rowtrac - Best of both worlds or master of none?